The Gambia's security forces have taken over the headquarters of the electoral commission, its chairman says, as the country's president refuses to accept his loss in recent elections. Alieu Momar Njai told the BBC that staff were barred from entering. 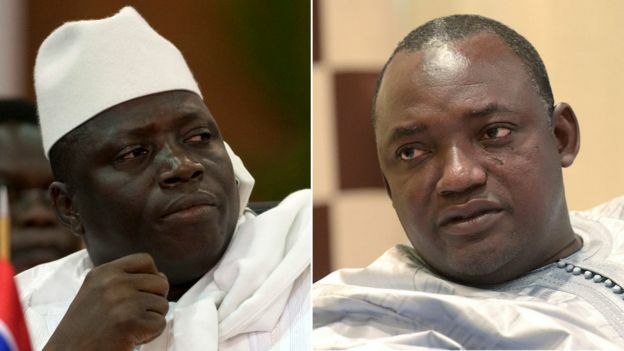 President Yahya Jammeh initially conceded defeat to Adama Barrow in a recent poll, before changing his mind. Visiting West African leaders have met Mr Jammeh to try to persuade him to step down after 22 years in power. "We hope and pray that he [Jammeh] accepts their advice and leaves office," Mr Njai said. The head of regional bloc Ecowas, Marcel de Souza, would not rule out sending in troops. "We have done it in the past," he told Radio France Internationale. "We currently have troops in Guinea-Bissau with the Ecomib mission. We have had troops in Mali. And therefore it is a possible solution." Mr Jammeh has questioned the validity of the count after the electoral commission changed some results, even though it insists the outcome was not affected. Mr Njai on Sunday defended the results and warned Mr Jammeh against a legal challenge. "The election results were correct, nothing will change that," he said. "If it goes to court, we can prove every vote cast. The results are there for everyone to see." The leaders of Nigeria, Ghana, Liberia and Sierra Leone are all in The Gambia for talks with Mr Jammeh. Gambia's army chief Ousman Badjie has seemingly reversed a pledge of support for Mr Barrow, the AFP agency reported, arriving at talks wearing a badge featuring Mr Jammeh's face on his uniform.